We started working with Hackle just shy of three years ago and the change in service was incredible. The support that the Management team offer to their staff is fantastic, and Hackle are always happy to help and support us where needed. The staff who work on our site are very helpful, and the team that sit behind them are always on standby for any queries. I’ve always found Hackle to be flexible and accommodating and I’m always impressed by their approach. It’s a pleasure having you guys on board with us. We’ve used Hackle for a number of years now – and I’ve always found them reliable, efficient and easy to deal with. We have a large site with numerous very old buildings that need a lot of looking after – but Hackle have always provided first class security guards and a slick and efficient support operation. Hackle Security Services Ltd have offered us complete professionalism right from the start of our contract. They communicate effectively, display an open and honest approach and provide the highest standards of customer service. I am pleased to have such a reliable and conscientious company looking after our security needs and would not hesitate to recommend them to anyone looking for a first class service. Hackle Security Services have now been engaged here at the Shopping Centre for the last couple of years and during that time we have found them to excellent provider of all our security services. They have always responded positively to any request outside the general contract and we have found working with them to be a pleasure as it has always ensures the Centre is run in an efficient way. Hackle Security have provided us with a professional and reliable service, with a dedication from the Contracts Managers’ rarely seen from other security firms. Their charges are very transparent, and they look after their staff. Accordingly, we have looked to provide them with further opportunities to build on the good foundations that they have put in place with us. Hackle Security Services have been providing both manned guarding services and mobile patrols across our multiple commercial and residential sites for over two years. Furthermore, they have been supplying relief concierge porters as and when required. Given that some of these properties are very high profile and require a dedicated pro-active approach, clients have been extremely impressed with their service. Their professional and attentive style is evident from Senior Management right through to every member of staff. In addition, we have been most impressed with Hackle’s response to issues of an urgent nature. We have found their systems and procedures are very well structured and highly effective. As such we would be more than happy to recommend them to any potential clients. I have retained Hackle Security Services Limited at my Shopping Centre since 2011. During this time, I have found the team, from Senior Management through to every member of the Front Line Security Staff, both professional and knowledgeable. The understanding of the clients’ requirement is exceptional and the attention to detail that their service provides is excellent. I would have no hesitation in recommencing their services to any prospective client. It is a pleasure working with Hackle. They work hard to meet clients’ expectations and are incredibly professional and detail orientated. Our Security Officer is highly capable and proactive and has fitted in very well at our offices. I would not hesitate to recommend Hackle to any prospective clients. I am extremely happy with the service provided by Hackle Security Services Ltd. Their attention to the clients requirements is second to none. Their professional and attentive approach is evident from senior management and is bred through every member of staff. I feel safe in the knowledge that Hackle Security are protecting my site with a team of happy and professional security officers and would recommend them to any prospective clients. 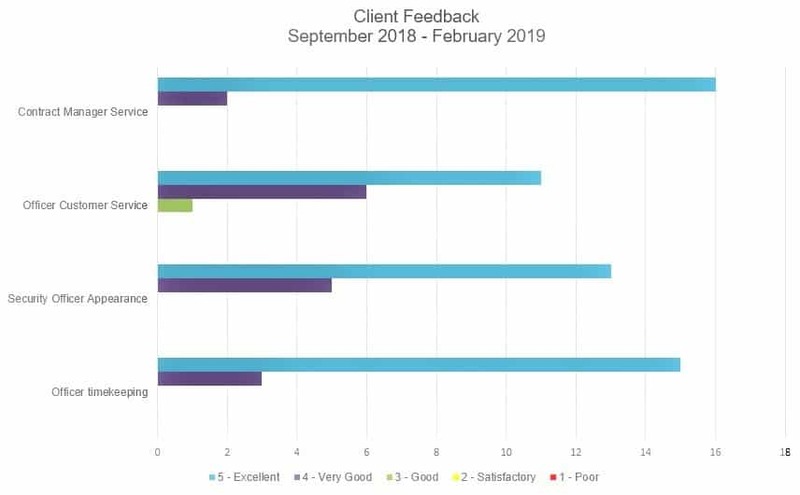 We regularly ask our Clients to complete a Satisfaction Survey, please see below the results of this for the period March to August 2018. Unlike some big Security Firms where the left arm does not know what the right arm is doing, Hackle’s Management Team are always there when you need them. Hackle scores very highly with regard to their humane and flexible work culture. It may not be the highest paying employer, but the wages are 100 percent accurate and always on time. Although I have only worked for Hackle Security for a couple of years, I have found the Company and the people I work with to be amazing. This is a group of very talented, dedicated and friendly people. Hackle Security is a Company that supports and believes in their staff. I have been in the Security Industry for 20 years and have learnt a great deal. However Hackle has given me the opportunity to continue to discover my hidden skills and gain even more experience in the industry. I am proud to be part of the Hackle team. Working for Hackle security is a good experience. I have been working for Hackle security for the past 15 months as a Receptionist (Front of House) Officer and I am really enjoying my time with the company and having an excellent experience. This company offers more than a job. With Hackle Security, I can build my career. I’ve received excellent training and development opportunities are limitless if you are ambitious. The friendly atmosphere of Hackle Security team and its diversity make every working day a pleasure. Hackle Security has provided me with the perfect grounding and structure to help me achieve my goals and deliver my targets. The working environment can be described as ‘open, relaxed, very engaging, informative, interesting and above all fun’. the atmosphere within the company is a great factor. Excellent and highly recommended. Working with Hackle Security is Okay because they care for their employees in my own opinion is a good company to work with. What I’ve noticed more than the other companies I have worked for Hackle security cares and shows compassion to its staff in my experience new staff it cares 100 per cent. I have been with Hackle Security for a year now and I must say it’s a great company to work for. It’s a company were you are valued and not just a number. I say this as I have had experiences with other security companies and I must say Hackle Security really stand out. Also the management team and all the admin staff are a pleasure to work with. I would definitely like to remain and move my career forward with Hackle Security! I joined Hackle Security Limited as a London Area Relief Officer in May 2018. The company is very unique among other security outfits. The company takes pride in making the staff comfortable by making sure staff work in a conducive environment. The management are really professional. They deal with staff matters promptly. The relationships among the staff are very cordial based on my experience working at different sites and the training received was second to none. The relationship between the company and their clients’ are good and the Client takes the staff working on their site as family. I give kudos to the management and the entire staff, please let us keep up the good work we are doing. Since starting with Hackle Security in March this year, I have found the company is great to work for, with plenty of support when needed from Head Office and where I work in Folkestone. We have a great team here, with a real togetherness, which for me I’ve only had once before. I thank Hackle for giving me an opportunity to work for the company. 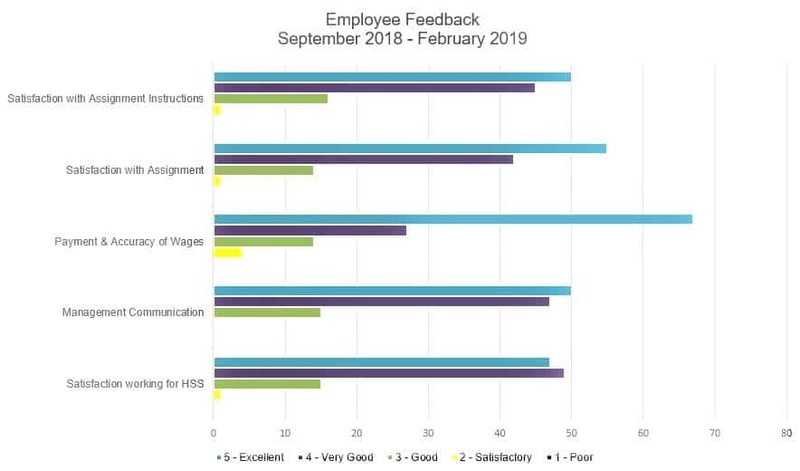 We regularly ask our Employees to complete a Satisfaction Survey, please see below the results of this for the period March to August 2018.